“Fashion is one thing; taste is another thing,” Madness frontman Suggs tells the camera, with all the authority of—well, Suggs, clad in a black shirt and creamy fawn jacket. “The clothes John Simons sells are 20 times better than any passing fad I have seen, before or since.” The scene cuts to John Simons himself, arranging shoes, adjusting a sharp cravat—and then Paul Weller appears and describes John’s store as “a revelation”. This is John Simons—A Modernist: a film about the life and times of the most influential, yet perhaps least lauded institution on Chiltern Street. A retailer for nigh on 65 years, and an influencer before the term existed, John has a reputation for dressing the dressers. Customers today range from the chaps working at Sunspel’s store, to Sir Paul Smith. He too appears in the documentary, alongside Kevin Rowland of Dexys Midnight Runners and Dylan Jones, editor of GQ magazine. “If anyone understands the significance of clothes, it’s John Simons,” Dylan states simply. “John got it.” Even John’s windows are “pieces of theatre”, Sir Paul enthusiastically agrees. “I was never seeking all this publicity,” says the man in question. “We’re not show-offs by nature. But the producer Mark Baxter approached us and asked if he could make a documentary about the shop and my life and so on.” John’s no egotist, and Paul, who works in the business, even less so: “I’m really quite a private person.” Nevertheless, after six decades of working in this industry, John has also learnt never to turn down an opportunity. “You are seen as an underground influence by a few people, and gradually it builds and builds. Now, with the film, we’re interviewed out!” He laughs, but looks a tad weary. He’s used to dressing the stars, not being one, though you might not guess as much from his cropped trousers, bright socks, and—in spite of the unseasonable warmth—eight-piece cap and jacket. His son, Paul, is in chinos and a soft checked shirt: equally on-brand, but younger, as if to exemplify the versatility of the style. The secret here is the Ivy League look—or rather, John Simons’ take on the Ivy League look, for “in America, they were buying this stuff without thinking,” recalls Dylan Jones, of the trend’s early years in the fifties and sixties. “John went over and said, that looks great, that looks great, I will take that out and put it in a British context—and suddenly you’re seeing it differently.” In Soho—London’s Soho—far away from the manicured lawns of Harvard and Princeton, the look increasingly known has entered a whole new league of cool. “This was the American look we really liked,” Paul Weller explains. “It had Jewish East End, a bit of West End, a bit of north London, a bit of New York, a bit of Kingston, Jamaica. The look sold,” he continues—and as John Simons sold to London’s musicians, the fans of London’s musicians followed. If ‘this look’ sounds hard to define, it’s because it is hard to define. The title of A Modernist is as close as it gets, and the film runs for over 50 minutes. “John sees the big picture of modernism, and the role clothes played in that,” says Robert Elms: progressive, inclusive, with the best bits of past and present interweaving. “It is the only youth culture uniform that doesn’t look ridiculous in retrospect,” states advertising guru John Hegarty. It is Ivy League, via London, via John’s experiences as apprentice window dresser, St Martin’s college student and abstract art and modern jazz lover. 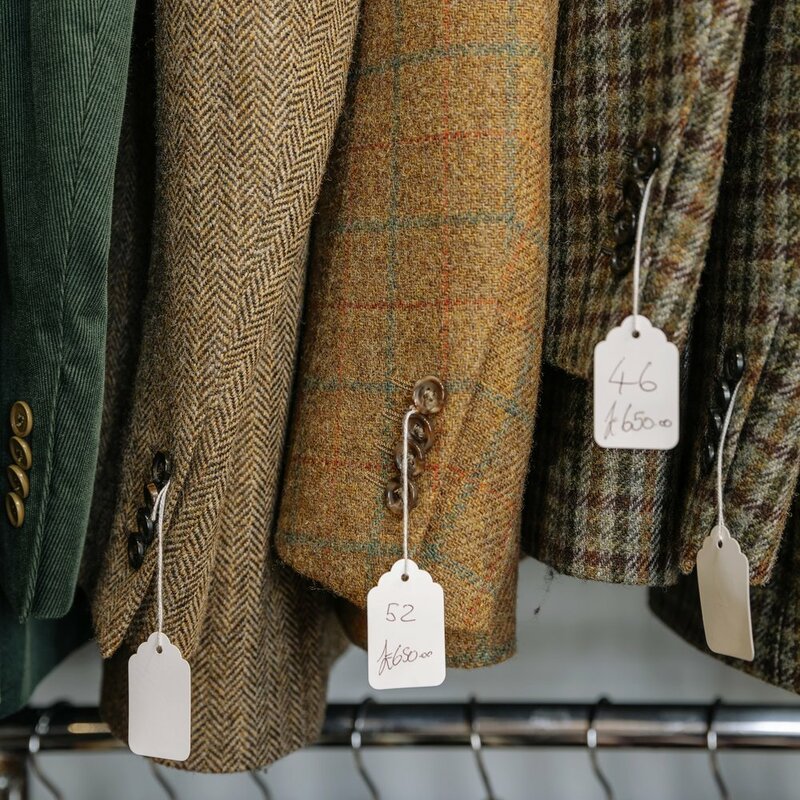 It is 60 per cent clothes he and his son Paul choose from various retailers and vintage stores in America and Britain, and 40 per cent their own effortlessly cool, perfectly realised designs. Paul Simons is a vital part of the business. In fact, while John and I wait for Paul to lock up and join us in the cafe across the street, John tells me seriously, “Paul runs the show now. I’m in two mornings a week, but he’s in charge.” An interior designer and cabbie by training, a window dresser, fashion designer and retailer by birth-right, Paul has inherited his father’s legendary eye. “My degree in interiors gave me an eye for composition, and what looks ‘right’—but I trained on the job. I’ve always been involved in the shop, in one way or another, throughout my life—and I like clothes, so it evolved that way.” Was it a given that he would work in the shop, just as his father had done? “You must joking!” laughs John. “No, I did other stuff first, but this is how it’s turned out,” Paul smiles. “And the black cab license is a great fall back, if things look iffy in future, Paul. Would keep you from starving, in any case.” John grins. In an age where one B-list celebrity can propel a young designer from an east London garret to the height of fame with just one Instagram post; where independent boutiques quiver and crumble under the shadow of global conglomerates; it’s a relief to know that, sometimes, hard work and passion are rewarded, and cream also rises to the top.